The Shwemawdaw Pagoda is best known in Myanmar as the country’s “Great Golden God Temple”. It is also called as Shwemawdaw Paya or spelled Shwe Maw Daw Pagoda. With a height that is more than 98 meters, Shwemawdaw is the tallest pagoda in Myanmar, a significant title since this Southeast Asian country has thousands and thousands of pagodas, temples, stupas and shrines. It is about 14 meters taller than the important Shwedagon Pagoda. It is so tall that it is visible from as far as 10 kilometers outside Bago city. Passengers traveling from Yangon to Bago can already get a glimpse of it before entering the city or when traveling from Yangon to Mandalay. 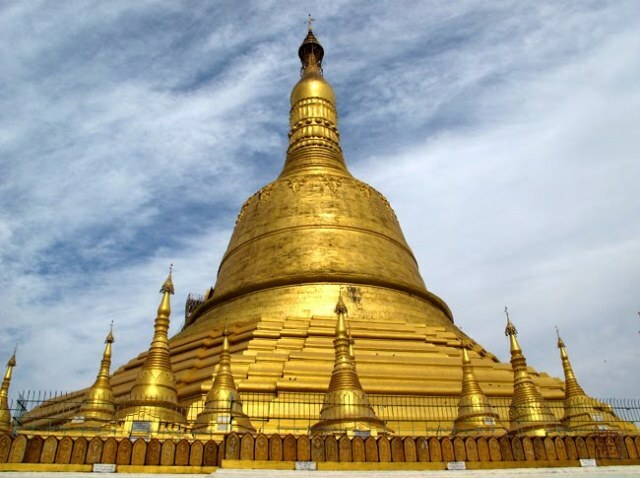 Along the Kyaiktiyo and Shwedagon pagodas, Shwemawdaw is one of the three important pagodas built by the Mon people.